Biologique Recherche cleansing milks remove all traces of make-up and pollution. They are applied like creams in an ascending outward massage from the neck up to the top of the face to remove impurities from the face, neck and cleavage. They are rinsed off with a moistened cotton pad. 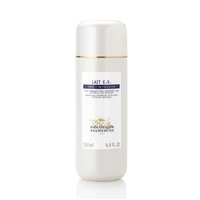 The active ingredients initiate the beauty treatment and leave the skin soft and refreshed. These products are used in the first stage of every Biologique Recherche beauty care program and are used every day in the morning and in the evening. Make-up removal should begin on the eye area using a spotlessly clean cotton pad.